Continue reading Grind Over Kyiv! 4-way grind split with Meat Cutting Floor, Japanische Kampfhörspiele, Brud and Nervous Impulse! Continue reading 4-way grind split with Meat Cutting Floor, Japanische Kampfhörspiele, Brud and Nervous Impulse! Massive re-press at Horns and Hoofs rec! Nekrofilth / Necrocannibalistic Vomitorium Carcass Grinder / Necrocannibalistic Vomitorium Abigail / Necrocannibalistic Vomitorium Necrocannibalistic Vomitorium / Sete Star Sept Lividity / Necrocannibalistic Vomitorium Send all your questions to vomitorium69@yahoo.com Continue reading Massive re-press at Horns and Hoofs rec! On this day, 4 long years ago Good Guys Go Grind was born. Lead by a man who’s passion for reviewing and listening to music continues to drive him forward today. 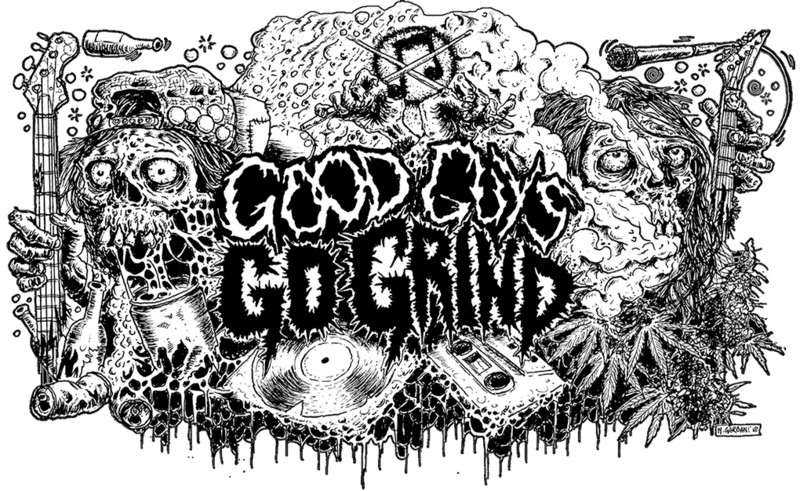 Good Guys Go Grind seemed to explode over night and became one of the biggest Underground Media outlets in the Extreme Music community. Now, the 2 man team of Alex and Shawn push ahead into the unknown. Where will the future take us? Continue reading 4th anniversary! Necrocannibalistic Vomitorium – Hvmani Corporis Ossvm! 6th album from Ukrainian pornomaniacs is out! For orders / trades write to: vomitorium69@yahoo.com Continue reading Necrocannibalistic Vomitorium – Hvmani Corporis Ossvm! event Continue reading Noise party in Kiev! VAVA demo 2017 – out now at Rotova Porojnina Records! VAVA is a onemanband harshnoisecore from Kyiv! On this tape you will find 49tracks x wall of noise x drums x antihuman screams. Only 16 copies! You can order this stuff HERE! Continue reading VAVA demo 2017 – out now at Rotova Porojnina Records! Continue reading Extreme Noise tour! Self-titled tape by "Zombies Eat My Neighbours" coming soon on Surrogate Rec! Continue reading Self-titled tape by "Zombies Eat My Neighbours" coming soon on Surrogate Rec! Fresh shirts from Necrocannibalistic Vomitorium! Send your perverted orders to: vomitorium69@yahoo.com Continue reading Fresh shirts from Necrocannibalistic Vomitorium! Necrocannibalistic Vomitorium / Gruesome Stuff Relish out now at Horns and Hoofs rec! For orders / trades write to: vomitorium69@yahoo.com Continue reading Necrocannibalistic Vomitorium / Gruesome Stuff Relish out now at Horns and Hoofs rec! Split Necrocannibalistic Vomitorium / Gruesome Stuff Relish coming very soon! This split will be released by Horns and Hoofs rec! Continue reading Split Necrocannibalistic Vomitorium / Gruesome Stuff Relish coming very soon! Split Deche-charge / Malad will be out soon! This vinyl will be out at: Underground Pollution, No Bread and BOG rec Continue reading Split Deche-charge / Malad will be out soon! New album from Zombies Eat My Neighbours! Pretty strange and experimental band Z.E.M.N. (Ukraine) finally recorded their new album! You can check their noise HERE. Also boys need a help with releasing it. So if you have interest just contact with them! Continue reading New album from Zombies Eat My Neighbours! Split tape Nekrofilth/Necrocannibalistic Vomitorium out now at Horns and Hoofs rec! For all questions write to: vomitorium69@yahoo.com Continue reading Split tape Nekrofilth/Necrocannibalistic Vomitorium out now at Horns and Hoofs rec! Split Methadone Abortion Clinic / Necrocannibalistic Vomitorium out now! For all questions write to: vomitorium69@yahoo.com Continue reading Split Methadone Abortion Clinic / Necrocannibalistic Vomitorium out now! Debut album from Warningfog out now at Freak Friendly diy! You can order this tape HERE! Continue reading Debut album from Warningfog out now at Freak Friendly diy!